The aerodynamic Rukus Xtreme on the left, Rukus II on the right. Photo: Eli Milchman. 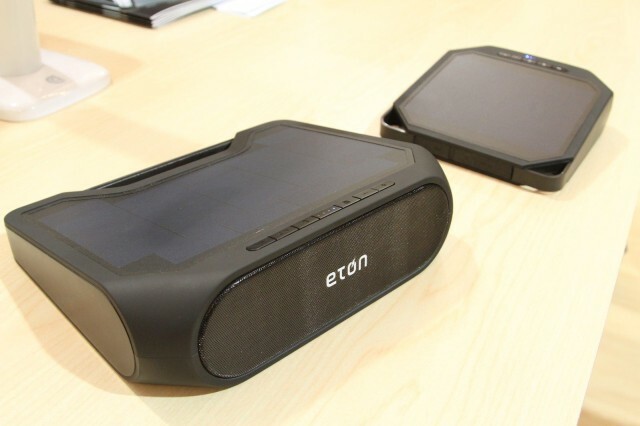 LAS VEGAS — Eton has improved the wedge-shaped, solar-powered Rukus Bluetooth speaker it introduced just over six months ago, and are now calling it the Rukus II; they’ve also built a second, bigger, badder (and more expensive) version they’ve naturally dubbed the Rukus Xtreme. Like the original Rukus, the II is a speaker/speakerphone wrapped in a rubberized exterior that’s klutzproof and splashproof, and gets its power from the sun. But it gets Digital Signal Processing for better sound, and a more-efficient panel that charges its 1600 mAh after five hours in the sun. Another bonus: The Bluetooth has been upgraded to low-energy 4.0, which means better battery longevity (and also incompatibility with iPhones older than the 4S. The Rukus Xtreme is more serious. It gets all that, plus a much more massive 6600 mAh battery, bigger speakers with a bass radiator. Also serious is the Xtreme’s price: $230, versus the Rukus II’s pricetag of $130 (which is $30 more expensive than the original Rukus. It’ll be mid-year before you can get your hands on either.